The Stratford FFA worked with the Stratford Village Tree Advisory Board to develop an Environmental Appreciation Day held on October 1, 2016. Stratford FFA member Tristan Wirkus said, “the goals of this event are to increase the use of Heritage Trail, inform the community about tree identification and health, provide environmental awareness opportunities, and become a Tree City USA.” To become a Tree City USA a community must host an event, such as the Stratford FFA Environmental Appreciation Day. At the event there were approximately a half dozen display booths covering various topics. Some of the topics were maple syrup, UW Extension Master Gardener’s answering questions, fishing information and casting station, Stratford Tree Board, a local arborist and the DNR station, but one of the main topics was the Heritage Trail that had tree identification/information stations. 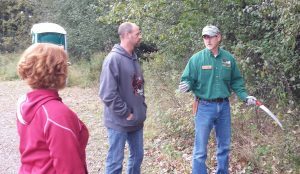 The Wisconsin DNR’s Division of Forestry was invited to have a part in the event. Regional Urban Forestry Coordinator Don Kissinger had a booth at the event to provide information to attendees. The booth information consisted of an EAB display, tree care brochures, a Tree City USA flag and Don even presented a tree pruning demonstration. The event hosted community members, families and students interested in learning more about the environment and urban forestry. The increasing interest in urban forestry is inspiring. With 2016 being the 40th anniversary for Tree City USA, it is great to see more communities getting involved. For more information, contact Ellen Clark (EllenA.Clark@Wisconsin.gov), DNR Urban Forestry Communication Specialist, 608- 267-2774.